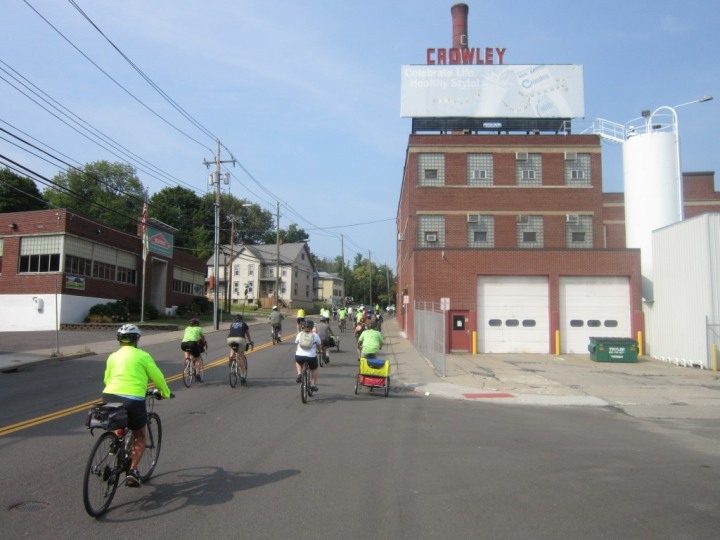 The 9th Annual Binghamton Bridge Pedal is a 9 mile leisurely ride that starts and ends at TechWorks!, 321 Water Street, in downtown Binghamton. Pedal alongside the Susquehanna and Chenango Rivers, and throughout the city, crossing several landmark bridges. There will be several stops at local parks, as well as significant historic and cultural sites along the way. Tour guides from several transportation, cultural, historic, and community organizations will be at the event to speak about these significant sites. Riders will be in one group, staying together throughout the event. At the end of the bike ride, get refreshed with ice cream and frozen delights at the 4th annual Coolest Dessert in Town Contest! You need not pedal to vote your tastebuds at the Coolest Dessert in Town contest at TechWorks! Join in the family fun with a safety-escorted bike tour around Binghamton along the Chenango and Susquehanna Rivers. All Bridge Pedal tickets include the ride, a 100% cotton T Shirt, and entrance to the Coolest Dessert in Town Contest. Register here for discounted tickets and a T Shirt that fits. Most Unusual Flavor: Upchuck - with chocolate chips, cookie dough, nuts and the kitchen sink.